I was browsing Tumblr and came across a TED Talk regarding human fear and avoidance of death. In the talk, Stephen Cave presents his viewpoint that humans begin to fear death from a young age and may being to believe in one or many biases that promise some type of safety net that will save us from death or at least make it an easier process. Throughout human history, most cultures have had myths that promise everlasting life in some aspect. While the idea of these myths may seem like they only relate to magic potions that stop the aging process, Cave argues that the religious idea of a savior who gives everlasting life fits into this category as well. The medical advances in today’s world and the promise of postponing death through various medical procedures also fall into this spectrum. Obviously, the statement regarding religious salvation as a myth is very controversial . However, when I listened to the talk the main point that stuck out to me due to our conversations in class was that everyone has their own personal way to deal with imminent death. For some it may be religion, while for others it could be the promise of stem cell research that will be able to completely rebuild the human body. Cave does make controversial statements, but I think the most crucial part of his speech is that we are all biased to believe in something that helps us cope with our fear of death. There is no right way to cope with death and the point is that we all partake in this action. One of our lectures in class discussed how Medieval culture embraced death because it meant that those close to death would hopefully be going to Heaven to start their true life with God. Though it may seem like these people did not fear death, I think they were using the idea of salvation to cope with the end. Even with these beliefs, stories, and promises, death will remain something to be feared because it is the end of our existence and all we have worked for in life. I agree with Cave’s concluding statement that the only thing that truly matters is that we live our lives exactly how we want to. Death will happen at some point despite our efforts to stop it. Thus, there is no harm in holding a certain belief or idea that can help slightly relieve the fear of death. These are what allow us to focus on the parts of life we can control and truly live everyday to the fullest. In an article entitled, Endings: A Sociology of Death and Dying, Michael Kearl discusses the statistics behind death. I was shocked to find that the rate of suicide among men aged 85 and older is 155% higher than of the age group aged 15-24. I found this extraordinarily telling of elderly citizens opinions toward death and wondered if the recent increase parallels the development of life sustaining technology. Are these statistics telling us something about American’s desire to die in control? Do they reflect a failing system of geriatric care? Or does it reveal something more profound about the dwindling quality of life as one ages? In light of the courage and genuine contentedness of Sack’s words, I found it difficult then, to understand why elderly suicide statistics are exceedingly high. What could foster such a drastic difference of attitude towards one’s death? Is there a biological explanation why some people desire death to the point of suicide while others publish articles on their deathbed asserting they are not yet finished with life? Could this be an effect of education, economics or religion? Investigating attitudes towards death would educate society about this oftentimes-taboo topic and hopefully allow us to view our own lives as the “enormous privilege and adventure” that Oliver Sacks did. While the idea of being buried in a casket spans multiple societies, Ghanaians have put a modern twist on this tradition. “Fantasy coffins,” as they have been dubbed by reporters, are caskets shaped like something relevant to the person being buried. From cars to animals to mobile phones or even a camera, Ghanaians are requesting increasingly diverse casket shapes. Just what do these unique caskets represent? For some families, the casket shape represents what the person loved to do- a pineapple shaped coffin for a man who grew pineapples, one that is fish shaped for a fisherman, etc. Others can represent some sort of ambition- a woman who had never flown before was buried in a casket shaped like a plane. The choice of casket design can be a reflection of status, with some being shaped as luxury cars or other high end products. Of course, some people choose a more religious design. One carpenter in Accra told BBC reporters one of his most popular designs is the Bible. 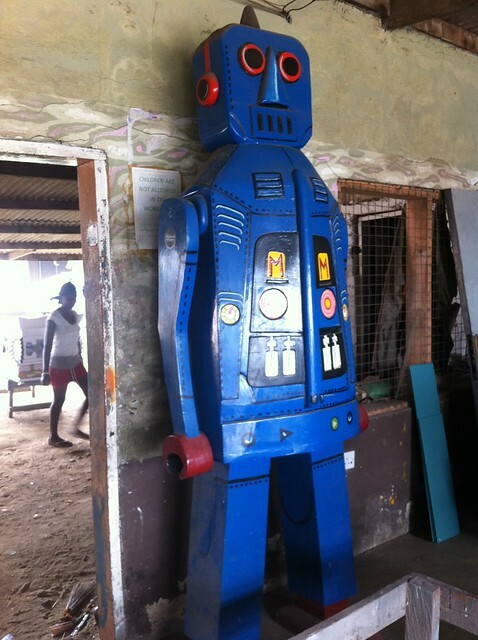 While the casket designs may seem lighthearted, Ghanaians still take death very seriously. By purchasing an elaborate casket, it is a way of showing respect for the family member who has passed. Also, the price tag of these custom made caskets is very high, starting at around 1000 Ghanaian cedi or approximately $250; many Ghanaians make this much in a year. Casket design can also be a point of contention among the family members of the dead if the deceased never left a clear indicator of what they would like their casket to be shaped liked, with family members disagreeing about what design is most appropriate to take the body into the afterlife. However, most families can agree that the purpose of the casket is to provide a respectful and meaningful vessel for the deceased. In the era of Facebook, Twitter, and Instagram it seems as though images are constantly being uploaded, shared, and “liked.” While most publicly shared photos are flattering selfies or snapshots of kittens and babies, they occasionally showcase a darker subject matter—death. Although it has not been long, several news sites including The Wall Street Journal claim that this image will join a collection of photos, such as ones from the Great Depression and the Vietnam War, thought to have changed history. Both David Cameron and Manuel Valls, Prime Minsters of the United Kingdom and France respectively, have increased efforts to support and provide resources for refugees in response to this photo. Why is it though, that despite the countless photos of Syrian refugees that have been published, this one has made such an impact? If I had to guess, the answer revolves around death, especially that of a young child. In an article from NPR, Los Angeles Times editor Kim Murphy admits that she is usually hesitant to publish photographs of corpses but her take on this photo was different. It is not violent or graphic, but rather heartbreaking in a way that makes people stop and think. 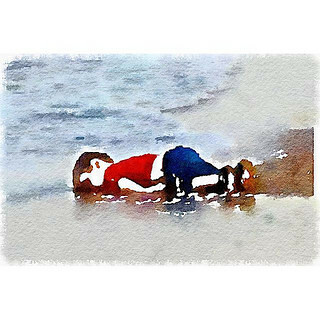 I think the photo of Aylan poses a lot of questions about publishing images of death online and in the media. Is there a benefit to displaying such images or is it insensitive? The presentation of art/artifacts in museums involve the art’s value, respect for the artist[s], and accessibility by the public, but how does this change when presenting subjects such as human remains? Everyone handles the subject of death differently which applies to how people handle seeing death as well, especially human remains. How can a museum handle the issue of presenting human remains? 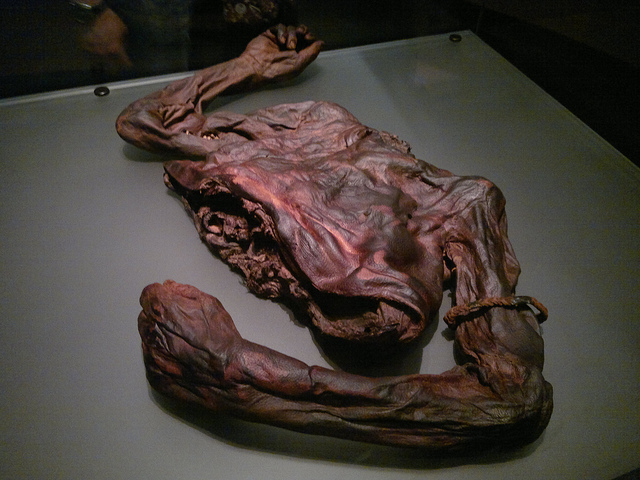 One interesting experience I have had for the display of human remains is of the bog bodies in the National Museum of Archaeology in Dublin, Ireland. My expectations differed greatly than what I saw. I expected to see glass cases throughout the room with the bodies inside. However, there were tall painted cylindrical columns with information about the bodies interspersed throughout the room. These information panels on the outside of the columns told the viewer everything about the body itself, the history and also had a faint sketch of the body. If someone wanted to learn about the bog bodies but did not want to see the bodies themselves, this way of presentation benefited their interests. If one wanted to view the actual body, they had to enter the opening in the column which went down inside of the column to where the body was located. Before this visit I had never thought that the presentation of human remains in a museum may disturb some individuals but I think this way of presentation done by the National Museum of Archaeology was very sensitive and thoughtful for all visitors. It allowed those who wanted to see the bodies to see them but also hid the bodies away so those who did not want to see the bodies didn’t have to see them. This sensitivity to presentation is also apparent in the Michael C. Carlos museum. The mummy that is on display is located in one of the side rooms so if a visitor does not want to see it they do not have to enter this offset room. The sensitivity to the presentation of deceased is an important aspect museums have to face when wanting to display human remains. Kim Suozzi died in January of 2013, but she may have a second chance at life—in 100 years or so. According to a recent New York Times article, Suozzi, who died at age 23 of an aggressive form of cancer, chose to have her brain cryogenically frozen in the hopes of one day being revived (possibly with her memories and personality still intact). As is the case in many situations involving death, Kim’s loved ones were at odds with each other. Her father, who ultimately was not given power of attorney, reportedly told Kim, “Dying is a part of life…we don’t life forever.” But Kim and Josh persevered, eventually securing the money for the procedure, mostly through anonymous donations. at a private facility in Arizona. Aside from the science fiction-y overtones in the article, I think the story raises some very real questions about the role of medical technology in overcoming death. Is freezing the human brain really a triumph over death? By all accounts, Kim Suozzi most definitely died on that January day. But if the possibility of coming back to life—in whatever form that may be—is real, then can we really write her off as dead? And how close is science actually to being able to achieve what Kim and Josh had hoped? I was simultaneously disturbed and intrigued by this article; I found myself wondering if in the future death will even exist at all.